Bed bug dogs used to detect bed bugs. Bed bug dog certification program. With the increased focus on green pest management and integrated pest management, bed bug detection dogs are gaining popularity in North America. Dogs are a safe addition to pesticide used as a management strategy. If operators can find out exactly where bed bugs are located, they can minimize the area that needs to be sprayed. Bed bug detection dogs are a viable and scientifically-proven alternative to traditional methods of pest detection. A 2008 report by the University of Kentucky Department of Entomology endorsed bed bug detection dogs by stating that the “reliability of the dogs has been impressive provided they are properly trained." Scientists at the university reviewed studies on the dogs and concluded that although expensive for operators, canine detection dogs were promising. Research conducted by the University Of Florida Department Of Entomology indicated that well trained bed bug scent detection canines are up to 98% accurate. Many experienced bed bug professionals support the use of well trained and maintained bed bug dogs. Dogs smell in parts per trillion, something a human cannot do, and detect bed bugs through all life cycle phases from eggs to nymphs to adults. References indicate that the average dog has about 250 million receptors and that blood hounds have about 350 million. 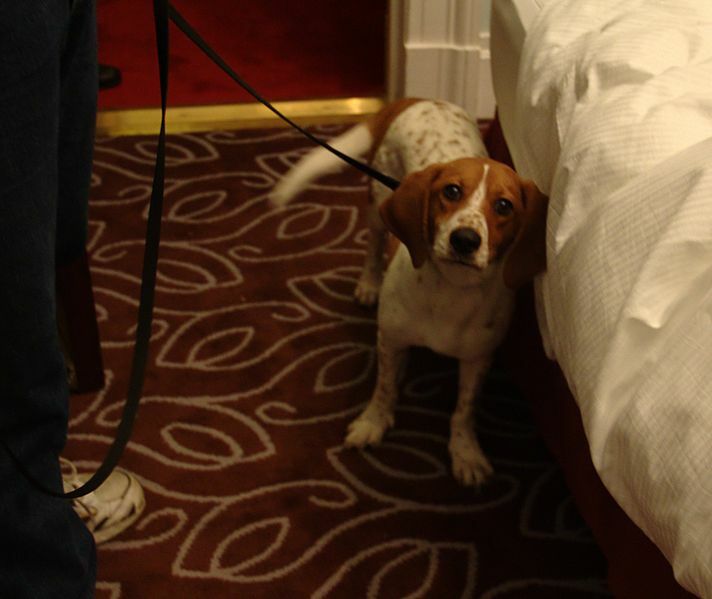 Bed bug detection dogs are relatively new. The National Entomology Scent Detection Canine Association, states that there are over 100 dogs currently working in the U.S. Single use dogs are specially trained to seek out bed bugs only. Canine security dogs used by the military or in airports are trained for a single detection purpose. Canine dogs trained for multiple pest detection are more likely to alert for a variety of pests instead of just bed bugs. For this reason, canines specifically trained for bed bug detection will offer superior results. Bed bug detection is complicated by the fact that the insects can hide almost anywhere. Bed bug detection dogs solve this problem because they are small and agile, finding bugs in places humans cannot such as wall voids, crevices and furniture gaps. There are many breeds that make suitable scent detection canines. Beagles and other small to medium breed dogs seem to be the most popular breeds being trained for these purposes. Small breed dogs are less intimidating and can be lifted to smell in hard to reach areas. Smaller dogs are easier to transport, take up much less space, and are easier overall to board. Scent detection dog handlers are trained professionals. These handlers receive extensive training by the canine training center that they acquire their dog from. Recently the University of Florida worked in cooperation with scent detection dog trainers to establish scent detection dog training certification and an association known as NESDCA.